The choice of verb depends on the context: where you are now, where you are going, for how long, and where home (or the place you are staying) is. I often hear English speakers use “retourner” a lot, because it sounds so much like “to return.” But most of the time, unfortunately, it is wrong. “To return” something in French is going to be “rendre” or “rapporter”. “Retourner” means to go back for a limited time (often because you forgot something there). So now let’s study carefully these verbs of motions. I strongly recommend you try memorizing the examples and associate the French word with a situation rather than trying to translate, since translating is likely to lead you into a mistake. This is a movement towards you, and where you are now. Maintenant, je suis chez Paul. Pierre va venir (ici) dans une heure. Now, I’m at Paul’s. Pierre is coming (here, towards me) in an hour. I’m leaving to run errands, but I’m coming back (here, where I am now) in 20 minutes. This is a movement towards a place you are NOT now. I am going to Pierre’s. “Aller” is very much used in French. We use it where English would often use “to visit” (use the link to see my blog post about this), or “to attend” and in many expressions. 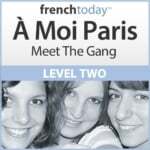 “Aller” a very irregular verb – use my audio verb drills to memorize it. This means to return, or to go back, but only for a limited time, either because you have forgotten something there, or you are returning for a certain time, but leaving again. Ce matin, je suis allée chez Pierre. J’ai oublié mon parapluie chez lui. Je vais y retourner ce soir pour prendre mon parapluie (et puis rentrer chez moi). This morning I went to Pierre’s. I forgot my umbrella there. I am going to go back tonight to get my umbrella – I’m going to pop by tonight to get my umbrella (and then I’ll go home). Maintenant je suis à Paris. Demain, je pars en Angleterre. Je vais y rester une semaine (et puis je reviendrai en France). Mais je retournerai à Londres dans 2 mois. Now, I’m in Paris. Tomorrow, I’m leaving for England. I’ll stay a week there (then I’ll return to France). But I’ll go back to London in 2 months. This means to return, to go/come back HOME or to the place where you are staying. “Rentrer” usually implies that you are not going out again. Je pars au bureau à 9 h et je rentre à 18h. I leave for the office at 9 AM and go back (home) at 6 PM. Normalement, j’habite à Paris. Maintenant je suis à Londres. Je vais aller en Italie, et puis je rentrerai le 3 novembre. Usually I live in Paris. Now I am in London. I’m going to Italy, and I’ll go back home (to Paris) on November 3rd. J’aime ce restaurant et je pense que je vais venir très souvent: You are talking to the owner and saying you’ll come HERE often. J’aime ce restaurant et je pense que je vais y aller souvent: You are talking to your friend about going to this restaurant often. Maintenant je suis chez Paul. Pierre va venir dans 1 heure (chez Paul). Moi, je vais faire des courses mais je vais revenir dans une heure (chez Paul). Now, I’m at Paul’s. Pierre is coming in one hour (to Paul’s). I’m going to run errands, but I’ll come back in one hour (to Paul’s). Maintenant je suis chez Paul. Je vais rentrer dans une heure. Avant, je dois retourner à mon travail parce que j’ai oublié mes clés. Now I’m at Paul’s. I’ll go back home in one hour. Before that, I have to go back to my work because I forgot my keys there. In English you’d say to return something to a store, or to give it back to a friend. In French we use two different verbs. Je vais rendre son livre à mon amis. Je vais rapporter cette robe au magasin.